Polyaromatic hydrocarbons (PAHs) form an important class of molecules, which can be regarded as small graphene species and which play a prominent role in the development of organic electronics. Scientists at Radboud University, the University of Amsterdam and FOM now show that the edge structures of these apparently similar molecules are responsible for spectacular differences in transport properties, allowing for smarter design of new materials. Nature Communications publishes the results on August 31. PAHs are made up of connected hexagonal carbon rings. They are useful to produce materials for new superconductors on the molecular scale, but they are also of astrophysical interest as a substantial fraction of the interstellar carbon is believed to be locked up in these very stable molecules. For all of these applications, a fundamental understanding of the electron distribution and its relation with topological features of PAHs is important. The exact way in which carbon rings are attached – the topology of the molecule – seemed to play a major role here, but it was unclear how. With advanced spectroscopic experiments, physicist Héctor Alvaro Galué together with scientist from Radboud University and the University of Amsterdam, has shown that the topology determines how the electron distribution is linked to vibrational dynamics of the carbon skeleton. With the FELIX free electron laser at Radboud University, Alvaro Galué determined the vibrational spectra of two positively charged PAH ions that consist of five connected hexagons. Pentacene has a zigzag edge structure (Figure 1, right and Figure 2, top) while the edge structure of picene is commonly referred to as armchair (Figure 1, left and Figure 2, bottom). Unexpectedly, a comparison of the IR spectra of the two PAH ions revealed large intensity differences for the vibrations of the two PAHs. Figure 1: On the left a schematic example of an armchair-edge, and on the right a schematic example of a zigzag-edge. Figure 2: Pentacene with a zigzag edge structure (top) and picene with an armchair edge structure (bottom). The (among molecular physicists) well known Born-Oppenheimer approximation constitutes a strict separation between electronic and nuclear motion. However, the described differences in the vibrational spectra of pentacene and picene show the contrary. During the first part of a vibration, one side of the molecule has a higher electron density than the other half side. During the second part of the vibration, the situation reverses: the electron density shifts to that side. The situation is comparable to a periodically tilting container filled with water, causing the water to slosh from one side to the other. The ‘sloshing’ of the electron density – the electron flux - enhances the absorption of infrared light at the specific frequency of the vibrating carbon atoms. The current publication shows that the electron density sloshing in picene is enhanced, whereas it largely cancels in pentacene. Calculations suggest that this is not only the case for picene and pentacene, but that it is an intrinsic property of PAHs with zigzag and armchair edge structures. 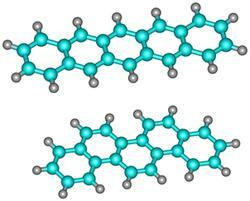 This provides valuable insight into the electronic properties of these two classes of PAH (and graphene) topologies. For more scientific details, please see here. This project was financed by NWO (the Netherlands Organisation for Scientific Research) and FOM (the Dutch Foundation for Fundamental Research on Matter).